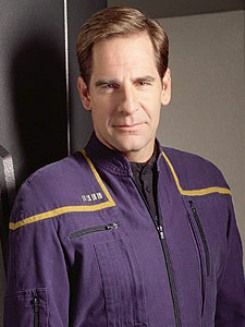 Jonathan Archer was born in 2112 to renowned warp scientist Henry Archer and his wife Sally. Despite being born in upstate New York, Archer variously claimed to have lived "all" or "most" of his life prior to 2151 in San Francisco. One of Jonathan's earliest inspirations for space sciences was a copy of The Cosmos A to Z, which he got on his eighth birthday, in 2120, from his father. Jonathan spent hours staring at its front cover depicting the Arachnid Nebula. His fascination for space led to him wanting to serve in what became the United Earth Starfleet from an early age, so, in at least one astronomy book he owned as a child, he styled his name on the ex libris as "Admiral Jonny Archer." In 2121, while he and his father built and flew a remote-controlled starship model, Jonathan eagerly asked his dad when "his new starship" would be ready to fly. Henry responded that it would take many more years, but that Jonathan should not distrust the Vulcans for having held back Humanity's technical progress, as they probably had their reasons. Also in his youth, Jonathan achieved the rank of Eagle Scout in the Boy Scouts. During his time there, he earned twenty-six merit badges, including a Wilderness badge which he received in a rain forest in New Zealand. In school, Jonathan was called to the principal's office only once, for passing notes to Katy Bentley. On the day before he entered flight training, Jonathan asked his father what would happen if he failed. The elder Archer's response was, "Don't fail." Tragically, in 2124, his father died of Clarke's Disease after suffering from frequent hallucinations and pain for years, sometimes not even recognizing his own son. However, the relationship that Jonathan shared with Henry's friend, Emory Erickson, strengthened, and Emory became like a surrogate father to him. As an undergraduate in California, Jonathan was an accomplished athlete in the sport of water polo. During his senior year, he participated in the 2134 North American Water Polo Regionals. The match featured a come-from-behind victory for his team, who were down by two goals in the last minute of play. The nature of the rally became a mantra that Archer carried forward into later life, such that he always believed he could win, no matter the odds. Following the victory in the regionals, he and his team went on to participate in the championship round of the tournament that year. During his early 20s, Archer was on a trip to East Africa where he witnessed a gazelle giving birth. He remembered his surprise at seeing how fast the newborn managed to stand up on its feet and run along with the herd. A few years before Starfleet was chartered, Jonathan gave serious thought to serving on a cargo ship, but decided against it. As a commander, Archer was one of four test pilots in the NX Program in the 2140s. In 2143, he and A.G. Robinson became not-so-friendly rivals in wanting to be the first to fly the NX-Alpha. Though Commodore Maxwell Forrest ultimately gave the assignment to Robinson, Archer had spent the most time in the flight simulations and got the engines to a ninety-two-percent efficiency. Robinson, however, was determined to break warp two. He did, with Archer serving as the flight director in NX-Control, but the NX-Alpha was destroyed; Robinson managed to get out just in time via an escape pod. The incident led Starfleet to suspend the NX program at the urging of the Vulcans. Robinson blamed the destruction of the craft on flaws in the engine Archer's late father had designed, which eventually led to the two of them coming to blows. Eventually, however, Archer reviewed the data and conceded that Robinson had been right. After devising engine modifications to compensate for the flaws, Archer and Robinson, with the help of Lieutenant Charles Tucker III, took the NX-Beta on an unauthorized field test. With Archer at the controls, the craft achieved a new speed record of warp 2.5. Archer and Robinson were grounded for three months for their actions, but were successful in convincing Starfleet to resume the program. A few years prior to the launch of Enterprise NX-01, Archer was a guest aboard a Vulcan Maymora-class ship, the Yarahla, which made a run to a dark matter nebula. He helped set up the graviton telescope, and also spacewalked in a Vulcan EV suit. Later in the 2140s, Archer was on Titan as part of the Omega training mission, along with Tucker. When Tucker's environmental suit malfunctioned, Archer saved Tucker's life by preventing him from taking off his helmet on Titan's surface. In 2150, the final selection for the captaincy of Enterprise took place between Captains Robinson and Archer. Admiral Maxwell Forrest gave the post to the latter, although Captain Gardner was originally considered the most suitable choice by Ambassador Soval. Jonathan Archer's mission as captain of Enterprise began in 2151, after a Klingon officer named Klaang was attacked on Earth by Suliban who, under the leadership of Silik, were trying to start a Klingon civil war as part of the Temporal Cold War. Enterprise's historic launch coincided with the Klingon incident, and Vulcan Ambassador Soval believed the launch should be pushed off until the matter with the Klingons had been resolved. Archer was not happy about the prospects of waiting around once again to launch the much anticipated warp five project and in fact believed that the Vulcan's suggestion to delay the launch was just another way to impede humanity's space exploration and expansion into the galaxy. Not wanting any further delays or interferences by the Vulcans, he suggested taking Klaang back to Qo'noS himself. Despite objections from the Vulcans, who believed Humans were too volatile and provincial to take on such a matter, Archer's proposal was fully supported by Admiral Maxwell Forrest, who gave Archer three days to assemble his crew and begin the mission. Archer recruited Denobulan physician Doctor Phlox as the ship's chief medical officer, Commander Charles "Trip" Tucker as chief engineer, and Lieutenant Malcolm Reed was assigned as the ship's armory officer. For the position of communications officer, Archer traveled to Brazil to recruit Hoshi Sato, who was an exolinguist and had a special aptitude with alien languages. It was not easy getting Sato, who was teaching at the time, on board but the prospects of being the first Human to decipher the Klingon language were very tempting. Finally, as a concession to the Vulcans, and to have access to their star charts, Archer had to agree to have a Vulcan science officer with the name of T'Pol on board. It was expected that her assignment was temporary and that she would leave after the Klingon had been returned to his homeworld. T'Pol herself looked forward to the end of her assignment on board Enterprise. Even though halfway through it looked like the mission was not going to be accomplished, Archer was known for finishing what he had started. Moreover, he did not believe in giving up and returning home, as that would represent failure to the Vulcans and reaffirmation of their long-held beliefs that Humans were not ready for space exploration and should never have embarked on such a "foolish mission." After Klaang was returned to Qo'nos and war averted, Archer received word from Starfleet to "keep going" instead of returning to Earth. Realizing the mission would have failed without T'Pol's help, he offered to have her on board as his science officer and second-in-command. He admitted that, ever since he could remember, he had seen Vulcans as an obstacle which had been keeping Humans from standing on their own two feet. However, having been given the opportunity to finally begin Enterprise's missions, he realized he had to leave misgivings about Vulcans behind. T'Pol accepted his offer and made the request to her superiors personally. Remembering his father and the dream he had envisioned, Archer gave the orders for Enterprise to finally set sail into the unknown. Archer and Enterprise made first contact with the Andorians at an ancient Vulcan monastery at P'Jem. Even though the Andorians were initially suspicious of Humans because of their alliance with the Vulcans, they gained some measure of trust, particularly in Archer, when he assisted them in exposing a Vulcan sensor post hidden on P'Jem. Even though the decision resulted in the destruction of the ancient monastery, it was the beginning of a close relationship with the Andorians, in particular with Shran, which later proved invaluable when the Andorians came to the assistance of Enterprise during the Xindi mission in the Delphic Expanse. Archer's next venture concerned the discovery of a pre-industrial civilization populated by the Akaali. A plague was ravaging the planet, and a woman named Riaan, a pharmacist, was attempting to determine the cause. Archer helped her, and found that a hidden antimatter emitter in a local shop owned by a man named Garos had contaminated the water supply. Garos was really an alien who was mining the resources of the planet. Archer exposed him, and when Enterprise disabled his ship, Garos was forced to leave. Archer had come close to Riaan during the events and became briefly romantically involved with her. Archer again encountered Silik when Silik, in the disguise of a pilgrim invited on Enterprise, tried to disable the ship. He also met Daniels, who he thought was a crewmember, but was in reality a temporal agent from the future. Daniels informed Archer that Silik was trying to change the future, but Silik denied this and said it was Daniels who was the culprit. When Silik was found in engineering and confronted, he escaped; it was apparent he was the saboteur. Archer helped rescue a Klingon ship that was losing orbit and falling into a gas giant. Bu'kaH, a survivor of the accident, was convinced to cooperate with Archer in a rescue attempt after he convinced her that she would be letting her crew die a dishonorable death. Bu'kaH reluctantly let Archer take her on a reinforced shuttlepod toward her ship, along with an antidote to a neurotoxin which had rendered the crew unconscious. The Klingon crew was rescued along with Hoshi Sato, T'Pol, and Malcolm Reed, who had become marooned on the ship in a previous rescue attempt. Archer and T'Pol were captured on an away mission on Coridan by rebels backed by the Andorians against the government supported by the Vulcans. Shran, along with Reed and Tucker, rescued them. Archer visited a planet where Eska engaged in hunting sentient beings, telepathic shapeshifters. When they were afraid, they emitted a chemical that gave away their location and made them easy targets. On Archer's orders, Phlox came up with a plan to mask the chemical, which shielded them from the hunter's scans. The hunters left when they could no longer use their scans, and the beings were safe. Archer made first contact with the Ferengi later that year, although the aliens in question remained anonymous; official first contact was eventually made by Jean-Luc Picard. The Ferengi captured Enterprise by rendering the crew unconscious, robbing the ship of all valuables. When Archer woke, he, along with Tucker and T'Pol, was able to play the Ferengi off against each other and retake the ship. Archer accompanied an away team to a barren planet to salvage an abandoned ship. They had been told by D'Marr, an alien they met, about the ship and also that it was haunted. Arriving on the planet, the party found that a group of Kantare had inhabited the planet. Their behavior seemed strange, though, especially when Archer offered to transport them back to their homeworld. They learned that all but two of the Kantare were holograms created by Ezral, who blamed himself for the crash and the death of his friends. He had created the holograms to keep his daughter, Liana, company. Enterprise returned both to their homeworld. Archer, along with Travis Mayweather, was imprisoned in a Tandaran prison camp. The Tandarans were at war against the Suliban Cabal, and had interned innocent Suliban in the camp. Archer learned of the plight of innocent Suliban, who weren't involved with the Cabal but still suffered the wrath of the Tandarans by being imprisoned for years in these camps. Archer and Mayweather, along with Enterprise, escaped and released the Suliban. Archer was captured by a symbiotic creature who had stowed away on Enterprise. T he creature assimilated Archer's nervous system, along with others it had captured. When Enterprise offered to take it back to its home so it could be attached to its large host, it released Archer and the others. In February of 2152, while fleeing from two hostile Mazarite ships, Archer gave the order to increase speed to Warp 5, the first time the NX-class ship's Warp 5 engine was pushed to its theoretical limit. The ship eventually reached a top speed of warp 5.2, faster than any other Earth vessel had traveled at that point. During a visit to Zobral's village, Archer and Tucker got caught up in a civil war, and after an attack, they became stranded in a vast desert. With Zobral's help, Enterprise rescued them. While on shore leave on Risa, Archer met a Tandaran named Keyla Terrana, who, in the disguise of a Human, tried to obtain information about the Suliban from him. In March of 2152, after it appeared his ship's mission was over because due to destruction of a mining colony on Paraagan II, Archer was transported to April 9, 2151 by Daniels, who revealed the Suliban were responsible for what had happened. Returning to the present, Archer used knowledge given to him by Daniels, including the technical skill to construct a quantum beacon, to board a Suliban stealth cruiser and prove what they had done. As a result, Silik demanded Archer be captured. To save Archer, Daniels transported him to the 31st century, causing a major disruption in the timeline that apparently destroyed Earth. Fortunately, Archer and Daniels were able to repair the timeline, though not before Archer managed to learn that he was vital to the creation of the future United Federation of Planets. Archer made a regrettable first contact with the Romulan Star Empire. When Reed tried to disarm a mine attached to the hull, a spike thrust out of the mine and through Reed's leg, pinning him to the ship's hull. Archer, with Reed's instructions, was able to disarm the mine and save Reed. This led to a stop at an automated repair station that was just as dangerous as the minefield. The station used humanoid brains as co-processors in its computer by physically connecting the captive's nervous system to its network. The crew escaped, but not before Mayweather became one of the station's adjuncts and had to be saved. After insulting the Kreetassans during an away mission, Archer's dog, Porthos, was infected with a deadly disease. Phlox cured him, but not before Archer spent a whole night worrying about the relations with the Kreetassans and comforting his dog. Phlox not only saved Porthos, but provided Archer with advice that solved the diplomatic problem. Archer led a team of crewmen in teaching a mining colony to defend itself against Klingons. The crewmen stayed with the miners while they drove off the Klingons. Archer helped T'Pol track down Menos, a rogue Vulcan agent who had become a weapons smuggler. When Menos played on T'Pol's guilt concerning an earlier incident in capturing another rogue agent, Archer was able to help her put her guilt aside and do the right thing. Archer and Reed were sentenced to death when exploring a planet. Reed had accidentally left behind a communicator, and when he and Archer tried to retrieve it, they were captured. Their captors believed they were super-soldiers sent by their enemies. Heeding T'Pol's long-offered advice on inter-species contact, Archer decided that he and Reed would have to be hanged in order to avoid contaminating the pre-warp civilization. This early, solemn consequence of the as-yet-uncodified Prime Directive was averted, however, when the crew of Enterprise saved Archer and Reed using a captured, cloaked Suliban cell ship. Later that year, Archer granted asylum to Takret refugees. During a radiation storm, they had to take refuge in Enterprise's catwalk. The military, pursuing the refugees, boarded Enterprise and almost destroyed it when they tried to start the warp engines. Enterprise investigated a black hole that was part of a trinary star system. However, the radiation from the trinary system affected the crew, causing odd behavior and rendering them comatose. Though the exposure would otherwise have killed the crew, Archer was woken by T'Pol and was able to pilot the ship away from danger. Archer was once again drawn into a dispute between Vulcans and Andorians. He avoided a war when he mediated a territorial dispute between the two species. Archer and Tucker were arrested and sentenced to Canamar for false crimes. A fellow prisoner was able to hijack the ship with their help, but when they found out the prisoner was going to beam off the ship and crash it, killing the rest of the prisoners and guard, they foiled his plot and were rescued by Enterprise. When Enterprise discovered a futuristic vessel adrift in space, Archer ordered it brought on board for further investigation, and a Human body was found in the ship. The Suliban and the Tholians claimed that the ship belonged to them, and demanded that Archer turn it over immediately. Archer was worried that the course of the Temporal Cold War could be affected. During the battle, as they tried to activate the ship, it vanished, and the Suliban and Tholians left. Archer and his crew fought against the Borg two centuries before the USS Enterprise-D's encounter with them. Two Borg drones had been found in Earth's Arctic Circle and thawed out by a team of scientists that they then assimilated. These drones were from an unsuccessful attempt by the Borg in the 24th century to stop the flight of Earth's first warp-capable vessel via time travel. The drones, old and new, left Earth on an arctic transport which had belonged to the scientists. Enterprise intercepted and destroyed the ship, with Archer and Reed boarding it and setting explosives to make this possible. In the course of doing this, they fought and killed several of the drones. During first contact with the Vissians, Archer became close with their captain, Drennik. Drennik invited Archer to join him when he took a Vissian strato-pod deep into a hyper-giant. This first contact ended tragically when Tucker interfered with a cogenitor, a third gender of the Vissians who were second-class citizens. Archer was asked by the cogenitor to grant asylum, which he denied after a meeting with the Vissians. Drennik contacted Archer and told him that the cogenitor had committed suicide. In late 2152, Archer was captured by the Klingons after assisting Raatooras rebels. Put on trial on Narendra III, he was spared the death sentence through the efforts of his lawyer, Kolos. Archer was sentenced to labor in the dilithium mines on Rura Penthe, but managed to escape. He was hunted by the Klingons for this offense, at first through bounty hunters such as the Tellarite Skalaar, resulting indirectly in Archer making Human first contact with the Tellarites. Skalaar believed the Klingons would return his ship to him, but when he found out they had scrapped it, he helped Archer escape. During the expedition to the Delphic Expanse, Archer was hunted by Duras, who had been dishonored when Archer saved the Raatooras rebels from him. Archer destroyed Duras' ship and its crew with it. After a Xindi probe attacked Earth in 2153, Archer was given a new mission: search for the Xindi weapon, which required entering a dangerous region of space known as the Delphic Expanse, in order to find the ones responsible for the attack and prevent them from launching their weapon to destroy Earth. It took nearly six weeks before Enterprise came into contact with an actual Xindi, and even then he proved to be of little help, directing Archer to coordinates that contained nothing but a field of debris which used to be the planet Xindus. In September of 2153, while investigating an abandoned Xindi vessel on a planet, Archer, Hoshi Sato, and Malcolm Reed succumbed to a virus that mutated them into Loque'eque, a primal lifeform. Tret, the leader of an alien race, attempted to kill Archer in order to eradicate the virus. Even after being cured by Phlox, Archer continued to suffer strange dreams of the Loque'eque city. Phlox kept a sample of the virus as per Archer's instructions, as destroying it would effectively make the Loque'eque completely extinct. While visiting a planet to obtain trellium-D, a substance that would protect Enterprise from the anomalies of the Expanse, Archer helped rescue a woman, Rajiin, from slavers. However, Rajiin was really an agent of the Xindi, sent to obtain information about the Humans. Thus, the first battle between Enterprise and the Xindi occurred. Xindi-Reptilians boarded the ship and took Rajiin so they could retrieve the information she had obtained. Enterprise encountered a Vulcan ship in the Expanse. When Archer and T'Pol boarded the ship to see if there were survivors, they found that the crew had gone insane. The Vulcans were intent on killing them and, after they escaped, Archer's only choice was to destroy the ship. Archer spied on a Xindi research facility, and convinced a Xindi-Arboreal, Gralik, that the Humans were not a threat. Gralik gave Archer a canister of kemocite, fuel for the weapon, to analyze. In October of 2153, Archer suffered a mild concussion from an encounter with a spatial anomaly. He eventually recovered. Archer encountered a Human colony populated by descendants of 19th century Americans. He helped them reconcile with the Skagarans, who had originally kidnapped them from Earth to work as slaves on their planet. The descendants of the Humans had revolted and taken over the planet, relegating the Skagarans to slaves. Archer, following a gunfight with some local cowboys, helped convince sheriff and town leader MacReady to make changes to the area. When the Humans expressed a desire to be reconnected with Earth, Archer was forced to explain that his ship could not accommodate them. Nevertheless, he promised that Starfleet would eventually recover them. As a stopgap measure, he at least provided them with the current history of Earth to help them reintegrate with the main Human population. Archer and T'Pol went back in time with the help of Daniels to stop the Xindi from producing a bio-weapon that would destroy Earth in the past. He killed the Xindi and returned to the present. Archer dealt with a group of religious zealots who hijacked Enterprise, planning to use it in a religious war. When the lead zealot demanded that a crewmember be put to death for the "blasphemy" of taking scans of the "sacred realms", Archer tricked them into using the transporter on Archer himself; allegedly, it would disperse his atoms, but really he was just teleported to another part of the ship. After the ship was retaken, he returned the zealots to their homeworld, where he revealed their planet had been practically destroyed already, asking them before he left to consider if the "truth" really was that important. An Andorian starship commanded by Shran helped Archer and Enterprise track down the Xindi weapon by following a signal from one of several kemocite canisters that Archer had planted when he visited a research facility earlier in the year. The Andorians captured the prototype of the weapon, but Shran was under orders to return it to Andoria. Before Shran could leave with the weapon, Archer activated it, and Shran was forced to jettison it before it exploded. Despite the conflict, Shran transmitted details of the weapon to Archer. In an attempt to gather the whereabouts of the weapon, Archer captured Degra and, using mind control, attempted to convince him that both had been in a Xindi prison. He tried to gain Degra's trust so Degra would give them the location of the weapon. Archer told Degra that the weapon had been used and Earth had been destroyed, but that a civil war had broken out among the Xindi, resulting in a great loss of life. Degra discovered the ruse, but not before he let slip that the weapon was on Azati Prime. On the way to Azati Prime, Enterprise discovered a damaged Xindi-Insectoid vessel with no life signs on board. There, Archer discovered a hatchery containing Xindi eggs, some of which were still viable. He was suddenly spattered by a strange liquid that spewed from one of the egg sacs, and Phlox determined that Archer had been hit by a mild neurotoxin that made him believe he was the eggs' caretaker, and his actions began to jeopardize their mission. On the way to Azati Prime, Enterprise found a damaged ship containing an injured male alien. It was determined that the alien was a test subject and he threatened that his people, who were from another dimension, would take over the quadrant when Earth was destroyed. They were the Sphere-Builders, who had been manipulating certain Xindi species into destroying Earth. Arriving at Azati Prime, a fierce firefight began. Archer discovered that the weapon was hidden in an ocean. At that point, he declared he was not going to order any more deaths, instead choosing to personally destroy the Xindi weapon, despite attempts by T'Pol and Daniels to talk him out of it. However, the Xindi intercepted and captured him, though they released him after a lengthy interrogation. Degra was starting to believe the war was being motivated by aliens. In February 2154, Archer went before the Xindi Council to convince them not to launch the Xindi weapon at Earth. He had a hard time attempting to persuade them, but quickly made an ally of Degra. The other Xindi-Primate councilor, Jannar, and Kiaphet Amman'sor soon came around to Archer's side as well, but Commander Dolim betrayed the Council, stole the weapon, and killed Degra. In a final battle to save Earth, Enterprise was joined by the Xindi-Aquatics and Xindi-Primates. As the fleet of Reptilian and Insectoid ships were destroyed, the Sphere-Builders, the aliens behind the plot, tried to intervene. Sato was captured by Dolim to decode the weapon's software so it could be activated. The MACOs, under the leadership of Major J. Hayes, rescued her, but Hayes was killed. Archer, along with Reed and the MACOs, used Degra's ship to intercept the weapon. Enterprise proceeded to destroy the spheres in the Expanse. Boarding the weapon, Archer, with Sato's help, was able to cause a reversal overload that would destroy the weapon. As the away team beamed out, Archer was left behind and confronted Dolim, whom he killed. Enterprise destroyed all the spheres and ended the alien interference. Archer was believed to have been killed, having been aboard the Xindi weapon as it exploded while approaching Earth. After the destruction of the Xindi weapon, Archer was saved when he was thrown forward in time to the year 2379 in an alternate timeline. With no way to get back the Enterprise was assigned to patrol the Sol system which it did for three months before Archer was given command of the Defiant class USS Archer and given orders to join Project Full Circle.